Grillz Gold Diamond Teeth.Includes: One Set of Gold Diamon Teeth. 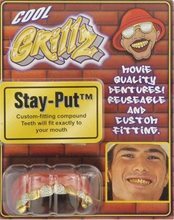 *Costume and Other Accessories Sold Separately.This set of Grillz Diamond Cut Fake Teeth is reusable and can be fit to your mouth. Stay Put custom-fitting compound will allow teeth to fit your mouth exactly. Rapper Medallions (Assortment).Includes: One Gold Rapper Medallion Necklace.Available Size: One Size Fits Most Adults and Teens. *Costume and Accessories Not Included. Sold Separately.Get down with some BIG bling, yo! It'll lighten up your wardrobe. 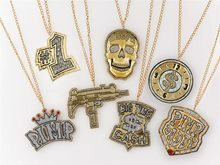 Top off your gangster, mobster, pimp or hip hip/rapper costume with one of these gold rapper medallions! Each one has their own unique design and flare. All pieces have silver glitter accents. Recommended for ages 15 and up. *NOTE: There is no color/style option for this item due to availability. 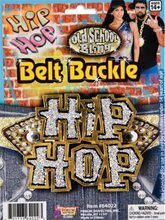 Hip Hop Belt Buckle.Includes: One "Hip Hop" Belt Buckle.Available Size: One Size Fits Most Adults. *Costume and Other Accessories Sold Separately. Not Included.This Hip Hop Belt Buckle features the words 'Hip Hop' in a tag-style font and is edged in gold and filled whith holographic silver sparkles. 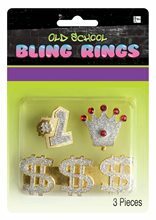 Ideal for any Old School or Hip Hop costume! Pimp Pacifier Gold,Billy Bob novelty pacifiers are top quality real working baby pacifiers. The novelty pacifiers are hysterical You are sure to get a few double takes whenever this fun little piece is in use. Old School Gold Belt.Includes: One Old School Gold Belt.Available Size: One Size Fits Most Adults and Teens. *Costume and Accessories Not Included. Sold Separately.WARNING!! : Keep away from fire!Features on Old School Gold Belt.  This Gold Belt is made of shiny metallic fabric and looks great over any 80's or Old School costume! Not recommended for use in play by children under 14 years of age.Made in China. Old School Fly Girl Earrings.Includes: One Pair of Gold Fly Girl Earrings. Available Size: One Size Fits Most Adults and Teens. *Costume and Accessories Not Included. Sold Separately. 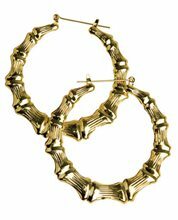 Features gold tone hoop earrings. 80's rap female costume earrings. 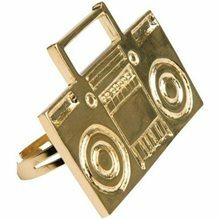 Old School Boom Box Ring.Includes: One Old School Boom Box Ring. Available Size: One Size Fits Most Adults and Teens. *Costume and Accessories Not Included. Sold Separately. This isn't exactly a piece of fine jewelry, but I was happily surprised at how cool these cheap boom box rings were at my local costume shop. These were in the section of costumes dedicated to "home boys and pimps", mostly consisting of oversized clocks and massive dollar bill pendants. Old School Pink Belt.Includes: One Old School Pink Belt. Available Size: One Size Fits Most Adults and Teens. *Costume and Accessories Not Included. Sold Separately. Features one Old School Pink Belt. One size, adjustable in rear. Shimmering pink costume hip hop lady belt. Old School Gold Leggings.Includes: One Pair of Old School Gold Leggings. Available Size: One Size Fits Most Adults and Teens. *Costume and Accessories Not Included. Sold Separately. Features stretchy, gold lamé halloween leggings. 80's old school female rap star costume pants. One size. Old School Pink Leggings.Includes: One Pair of Old School Pink Leggings. Available Size: One Size Fits Most Adults and Teens. *Costume and Accessories Not Included. Sold Separately. Features one pair of pink lamé stretch leggings for women.Ppart of our old school 80's rap woman costume series. One size. This metal Hip Hop ID Bracelet features chunky links and a glitter 'hip hop' logo. Great for your Old School costume!